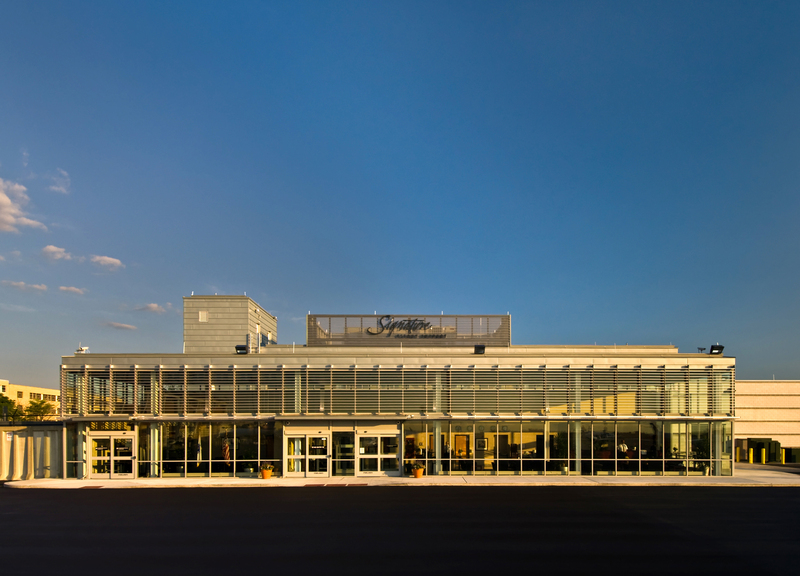 General Aviation Terminal for Boston Logan International Airport. 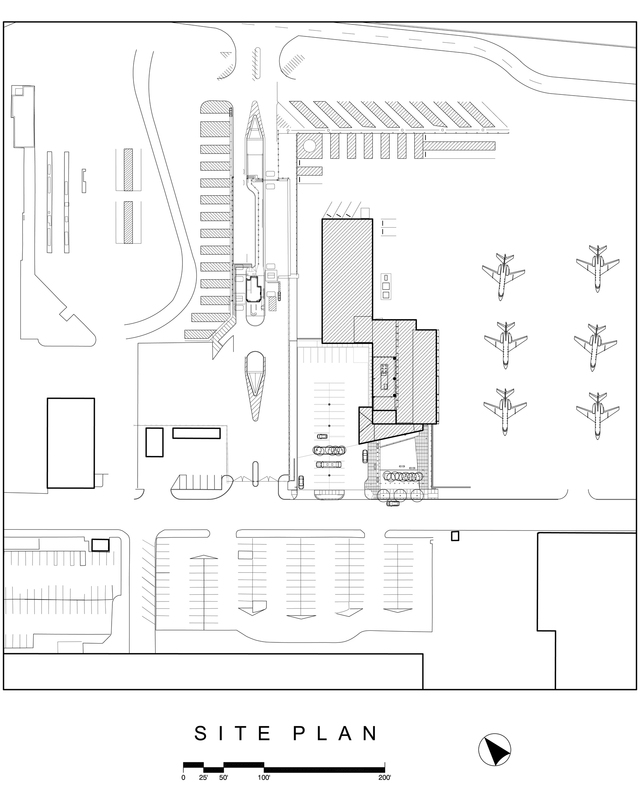 Chan Krieger Sieniewicz is Architect of a new 22,000 square feet, $11.2 million passenger terminal for private aircraft. The design program includes: passenger processing, a main waiting lounge, conference and office spaces, a pilot’s lounge, VIP lounge and related public and administrative support amenities. Design features of the two-story structure, include: full compliance with high design standards set by the Massachusetts Port Authority, Federal Aviation Administration, and Department of Homeland Security; state-of-the-art zinc alloy and glass façade that can withstand the harsh weather and environmental conditions from seawater, jet fuel, and deicing chemicals; dramatic entrance canopy cantilevered from the elevator/stair tower to provide weather protection for vehicular arrivals and departures; a two-story, glazed waiting room that extends the length of the facility; all public areas have panoramic views towards the runway; LEED certification (in progress); maximum natural daylighting and cross ventilation; external sunshading devices for energy efficiency; and a generous landscaped garden surrounded by natural hardwood that extends into the entrance lobby. >Boston’s Logan International Airport recently completed a $3 billion modernization project to create a world-class environment by expanding terminals, improving ground transportation and reducing air-traffic delays. As part of this effort, the General Aviation (GA) facility for Signature Flight Support is a unique and high-quality architectural design that serves as a gateway to New England and an air traveler’s first impression of the region. Utilizing a compact, two-story structure, the building is located directly to the west of Signature’s existing facility on Prescott Street. The site includes limousine and customer surface parking for 35 cars. In addition to the GA facility, the building includes an 8,800 square foot, multi-tenant Ground Service Equipment (GSE) operation housed in a separate structure on the same site. 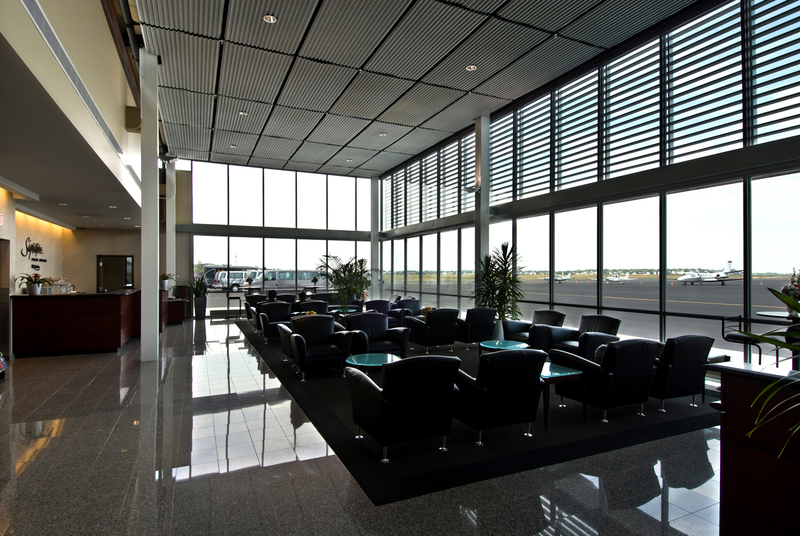 Ground floor uses for the terminal building include passenger processing, main waiting lounge and VIP lounge, pilots lounge, passenger amenities and office spaces. The second floor houses conference and office spaces and related general administration amenities. With maximum daylight and views of the runway from the east, the main waiting lounge is the building’s “living room” and primary public space – a spacious 112-foot long room supported on steel columns. This area has floor to ceiling glass and a continuous clerestory window. The 18’ high public space is shaded from the direct sun through horizontal and vertical louvers on the exterior, interior mechanical sunshading devices and low-emissivity glass help to reduce interior heat gain. While the east-facing façade of the waiting lounges are primarily glass, the terminal’s exterior skin on the west and north is composed of a combination of zinc metal cladding patterns. Treated hardwood at the building’s southern entrance and a well-lit, cantilevered canopy signify the entry and protect customers from inclement weather. The building entry is set back from Prescott Street by a 4,000 square foot garden – a “pocket-park” for the airport that creates a courtyard facing a soon-to-be revitalized Prescott Street. The lush, exterior garden and building lighting enhance the character of the architecture while responding to mandated security buffers and setback zones. The new Signature Flight Support terminal is be a LEED (Leadership in Energy and Environmental Design) certified building. 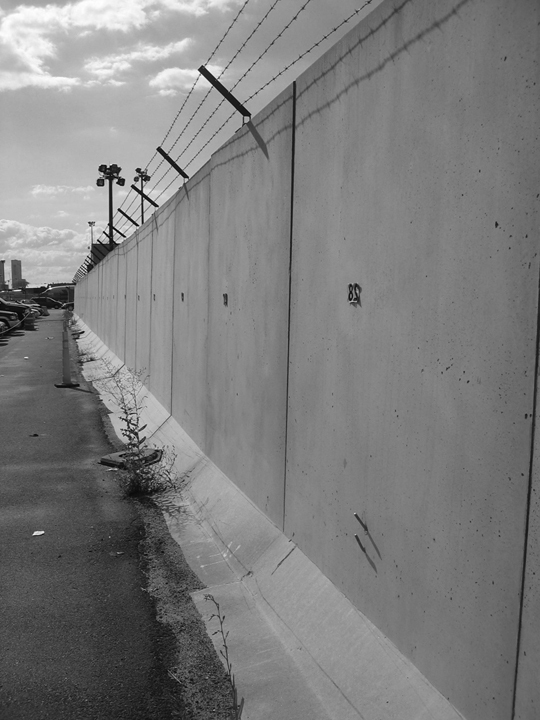 A continuous, 10 foot high concrete blast wall separates the unsecured “landside” from the secure “airside” around the perimeter of the airport runway. 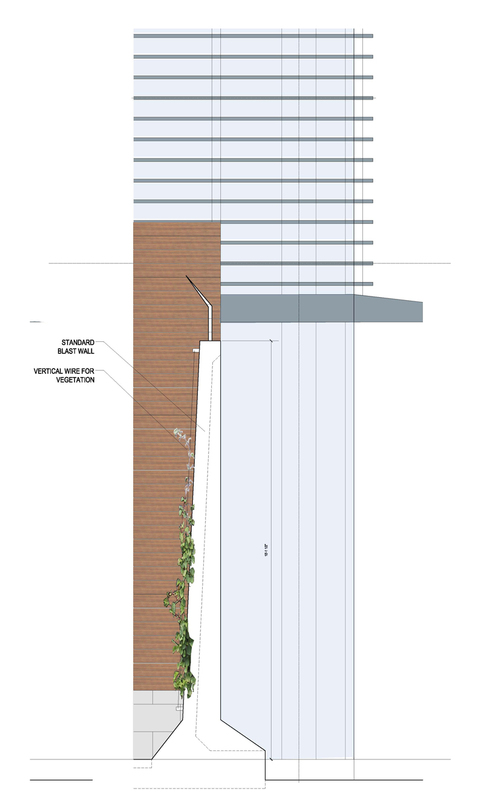 Utilizing this wall as a design opportunity, 4” mahogany planks are attached to the wall to define a garden. The wall continues as a cladding onto the exterior and interior of the buildings itself, uniting the inside realm with the outside. There are few exterior public spaces at the airport. In order to create a welcoming gesture to travelers, this pocket park creates a buffer between the access road and the building’s entry. The garden creates a forecourt and welcome reprieve from the harsh surroundings. As the facility is used around the clock, considerations for how the structure was perceived at night was a priority. Vertical light columns help to define the exterior garden and wall washers add accent light to the wood wall. A changing, multi-colored, light in the stairwell helps to create a strong visual marker in the corner of the stair tower. A significant, Zink-clad building canopy protects clientele from poor weather conditions. 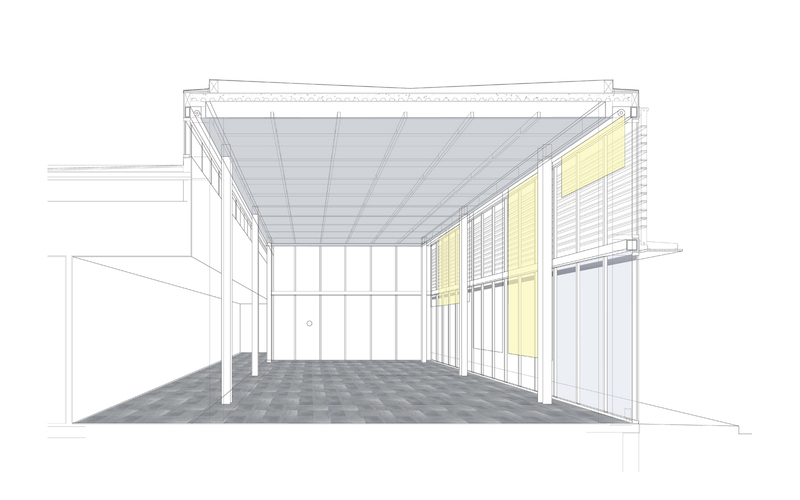 The angle of the canopy creates an axis that leads from the drop-off to the building entry. A two-story, glazed waiting room extends the length of the facility. Interior furnishings, materials and fixtures correspond to the client’s corporate identity employed in all their terminals world-wide. More intimate in scale than the main waiting lounge, the VIP lounge has its own separate entrance and exit to the runway. All public areas on both the ground and second floor have panoramic views of the runway. State-of-the-art zinc cladding and glass façade will withstand the harsh ocean climate and environmental conditions from seawater, jet fuel and deicing chemicals. The General Servicing Equipment facility ( a storage facility for trucks and maintenance) is clad with bands of concrete block. The block bands continue along the base of the terminal building, visually uniting the two structures. 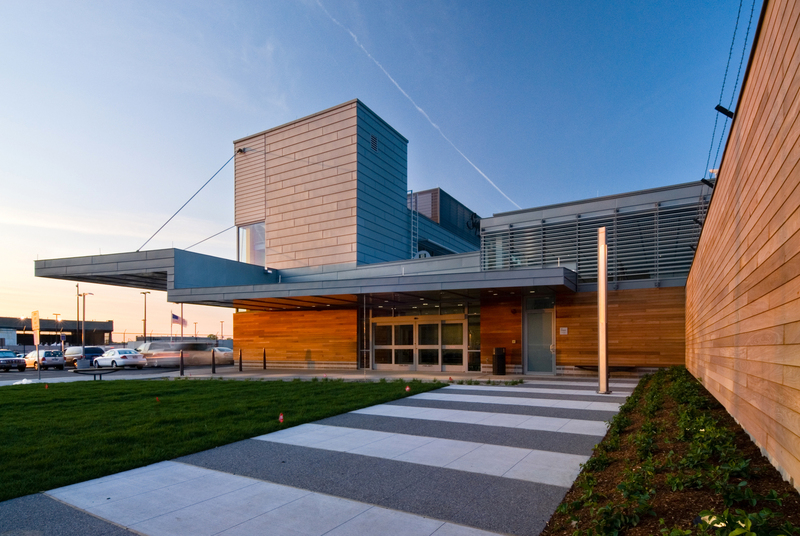 The General Aviation Terminal received a LEED rating from the USGBC.